When faced with the prospect of death - one's own or someone else's - there is often little time to prepare. This compact booklet is written for anyone who has to deal with death and needs information quickly. It is also for those who wish to be ready in advance. Crossing the Threshold presents a wealth of easily-digestible guidance - both practical and spiritual - on all aspects of death and dying. 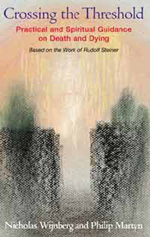 Writing from the perspective of Rudolf Steiner's spiritual philosophy, the authors suggest ways of coping with the time leading up to death and also the period afterwards. They examine different circumstances of death and offer advice on practical questions such as the arrangement of funerals, laying out of the body, legal requirements and wills. They also suggest how those who remain on earth can continue to relate to the departed souls of the deceased. In addition the authors helpfully clarify Steiner's approach to the question of how funerals should be conducted, and in particular how his advice relates to both members of the Christian Community and the Anthroposophical Society. NICHOLAS WIJNBERG was born in Natal, South Africa in 1960. He was ordained to the priesthood in 1991 and is presently posted to the congregation of the Christian Community in Forest Row, Sussex, England. PHILIP MARTYN was born in London, England in 1948, and works as a legal advisor to a bank. He is involved with the activities of the Anthroposophical Society in London.